You Can Help Mankind’s Return to the Moon…Now! Openluna was founded by Paul Graham, one of my dearest friends in space exploration. The Foundation carries his dream as well as that of other enthusiasts to go back to the Moon. No matter who you are, you can help them by just using a computer! GoodSearch is a Yahoo! powered search engine that will donate 1 cent per search to your desired charity. The best part? Openluna is a listed charity! Here are the steps: Go to http://www.goodsearch.com, type in OpenLuna in the text field below the search bar then click Verify. GoodSearch will now remember your choice as long as your IP doesn’t change. You can set http://www.goodsearch.com as your home page. Whenever you want to look up something, instead of supporting the rivalries Google or Bing, use GoodSearch! 1. Go to the search bar located at the top right hand side of the browser. Click on the down arrow. 2. Click on “Get more Search engines…” located at the bottom of the pop up window. 3. In the new page, search for add-on GoodSearch. It should come up as the top result. 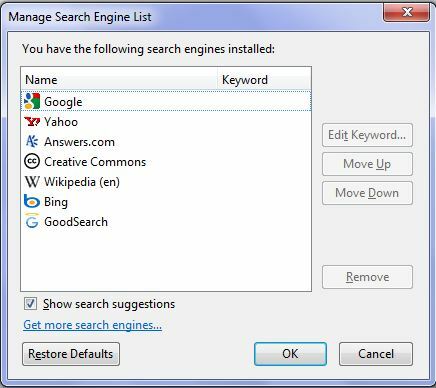 Now just install the add-on and set it as your default search engine!